Earlier today I logged into a MUD I just recently read about, not naming any names, and it was horrible with color. that many colors. While going through the process of my epileptic seizure I had to exit the game. Basically why I am posting is for those who WAY over color their MUDs to tell me what and why you want to do this. but is it me or does this not run people/staff away from bothering with that game? Let the comments fly! I'm glad to get a response so quickly but if it's just me, would you care to explain why you like MUDs that are way over colored? Is yours way over colored or what? This isn't to criticize you, I was mostly giving it humor but it's more for opinions on this. I'm always curious when this topic comes up where Lost Souls falls in the color-usage scales. Because it uses color very extensively and often in complex patterns, but also according to a set of coherent design principles that strictly exclude what I consider to be color overuse. An example of which is the work of a developer I once had who considered it appropriate to color a word bright magenta for the sole purpose of emphasis in a sentence – as if it were italics. I've rooted out that sort of thing wherever it's reared its ugly head, and I've logged into enough MUDs that immediately dropped pointless eye-searing interface frippery in front of me not to want to do that. It's not that I like way/poorly over-colored muds, but that it's so subjective. Clearly there are players on those muds, so either they're all color-blind or they do in fact like/tolerate those colors. So as I let my comment fly, it's you :). I guess that doesn't speak to the question of whether the color drives potential players away. It probably does, but so could any of a number of other factors. Agree. Different games have different goals with colors. I can speak to my own preferences. I prefer to have colors that are uniform and draw attention to certain things in a way that indicates status or type. I don't like text designed purely for decoration or representation of something (flame is a classic example). Not saying other schemes aren't legit, but I don't care to play them. I like things like that on objects and some of too much color is a good thing. It's just went you walk around and everything is bright magenta, bright green, dark green, bright red, bright blue and that sort. The flame example seems cool, but if it's on more than one thing it get's crazy. Frankly a smooth gradient in one direction of those colors (flaming – red, orange, yellow, white) might be better than a back and forth seesaw between them for the sake of keeping it reasonable. The trick is to not overuse color to the point where you can't tell anything about what's important. I think the simplest case is using colors to differentiate between say items, players, rooms, etc. With xterm256 colors you could use it like some games do to indicate the quality/rarity of items. That, though, is a little clich and is perhaps best tied together with some kind of skill/stat that determines whether or not your character can tell (like the identified/unidentified mechanic on a larger scale). Cute effects like that might seem cool, but they're totally dependent on the user's normal terminal type and settings. How cool does that look with a white background? Oh, you can't read the middle part of the string. How about a terminal with normally white on blue text? Yeah, the red and orange look good against dark blue. To me, that's just a lazy excuse for builders who can't take the time to properly describe how the object is on fire, via text. It falls back to, are you trying to make a text game, or do you really wish you could make a graphical game? These days, a good number of terminals and even a few clients support xterm-256, so if you want to make a pseudo-graphical game, you could actually generate a nice smooth color gradient, rather than clunky 8 or 16 color ANSI (some terminals still only do 8 colors + bold). 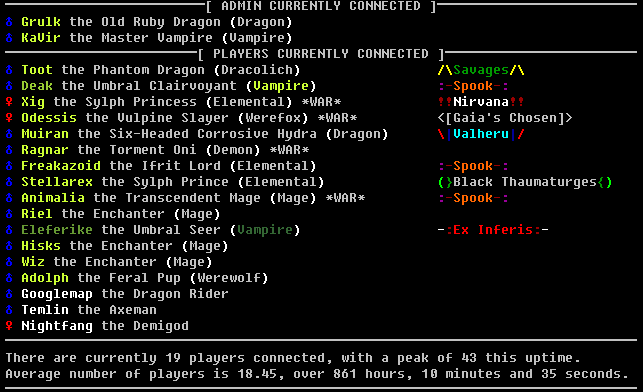 While I wouldn't recommend that for everything that's on fire, that usage seems very good for item attributes (ex. weapons) that show up in it's name to make obvious to the player what obvious to a person holding it. If I have a flaming broadsword a visual indicator is just as good if not better at describing the flaming bit of it as a 3+ sentence description. I know plenty of people who use white and linen backgrounds on their mud clients. Fortunately we have other options than crazy colored text or 3+ sentence descriptions to use as visual indicators. white on blue was the standard terminal color back in Ye Olde Days of MS-DOS and PC-DOS. Remember those text-mode file manager programs? Word Perfect? Visicalc? Yep. I prefer cyan on black, myself… but I know plenty of people who did the white on blue thing. Seriously? A white on blue terminal? Do you know anyone who actually does that? It's the default colour scheme for TeraTerm. Colouring in muds is one of my favourite rants. So much so that, according to PMs with a friend, I've been using the same rant for about 10 years. So I'll skip to the conclusion: IMO, colour should be for categories, not for decoration. Point taken. What would those other options be? To be clear, while I am aware of those things, it was not something I had to deal with on a regular basis, seeing as I wasn't even alive when that was the standard. The question really was do you know anyone that's STILL using that. We have plenty of better options now. At some level there is always the important thing that you don't have to and can't cater to every single person's personal thing. When I use a terminal I prefer white/green on black (although amber is kind of a pretty foreground color). The simplest option probably would have been to omit the white in that color set to cover that one case. I do hope you can figure out to change the default color scheme. :smirk: Aside from the point about the color scheme what on earth do you mean by using it for categories rather than decoration? If you've been using a rant for 10 YEARS, you need to quit beating a dead horse and move into the future, buddy. Frankly, at some point it simply becomes personal preference and obviously our personal preferences will always be different. Nothing wrong with a long-term rant, as long as it's about a subject that's useful to each new generation of mudder. The other thing I dislike about using color for decoration (instead of categorization), is that the user has zero choice in what those colors might be. Basically, if the normal smaug color system does &r red text &z, the &r gets converted to the terminal codes for red, and &z becomes reset. So for ANSI, that's ESCThe other thing I dislike about using color for decoration (instead of categorization), is that the user has zero choice in what those colors might be. Basically, if the normal smaug color system does &r red text &z, the &r gets converted to the terminal codes for red, and &z becomes reset. So for ANSI, that's ESC[0;2m and ESC[0m. That's all fine for hard-coding your colors, but what if you want to customize them on a per user basis? Either just for looks, or in the cases of color-blind players, or people who really want their bright white backgrounds? What I did was extend the color code system to allow symbolic names. &[RED] and &[RESET] would do what &r and &z did before, but what that also allowed was category codes like &[DAMAGE], which would be mapped to red by default, but which could be changed by the user to anything they wanted. So now, your game uses &[POISON], &[FIRE], &[HEALING], &[TELL], and so forth… users that don't muck with anything see a given color scheme that works like the old hard-coded system did, but consistently, everywhere. Basically, as an admin, your job is to SCREAM at builders who don't use categorized colors, since it breaks that consistency. While the current system just translates fancy-code -> ANSI, there's nothing stopping you from making it more clever. If you see there are 30 characters between the end of the &[RAINBOW] code and the start of another color code (whatever it may be)… you could do the translation so it makes your cutesy red/orange/yellow/green/blue/purple rainbow effect across those 30 characters. And then people who HATE that, can just remap RAINBOW -> RED, and be done with it. One supposes you could also just remap them to RESET to not have a specific color too, although that may interfere with BOLD, ITALIC, and so on. True. I do think MUDs in general have more longevity than rants, though. The clan founder can choose the clan name, brackets, and colours for their clan, which appears on the right side of the who list. The gender symbols are also colour-coded red/blue. The actual names in the who list are not decorative though, they're coloured depending on where the player is currently located (not so clear here, but that's because I changed my colour scheme). Likewise, the class name in brackets is coloured if they're in a PK location to indicate whether or not they're worth killing.